Posted on 6, February 2019 by EuropaWire PR Editors | This entry was posted in Business, Economy, Germany, Government, Industrial, News and tagged Destatis, euro area, indices of new orders, indices of turnover, manufacturers, manufacturers of capital goods, manufacturers of consumer goods, manufacturers of intermediate goods, Manufacturing, manufacturing in Germany, WZ 2008, X-12-ARIMA, X13 JDemetra+. Bookmark the permalink. For the month earlier, November 2018, the revised data is as follows: the new orders in manufacturing saw 0.2% decrease as compared to previous month (October 2018) and -3.4% on the same month a year earlier (November 2017). However, the new orders excluding the major orders, price, seasonally and calendar adjusted, have posted an increase of 3.5% in December 2018 vs. previous month (November 2018). Going into further details, both the domestic and foreign orders have also posted a slight decrease for the month of December 2018 when compared to the month earlier. The domestic orders decreased by 0.6% while the foreign orders saw 2.3% decline. 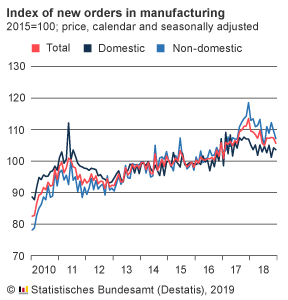 When looked into the euro area, the new orders have actually increased by 3.2% while new orders coming from other countries decreased by 5.5% as compared to November 2018. For the manufacturers of intermediate goods, the new orders in December 2018 were 1.2% less as compared to November 2018 while the manufacturers of capital goods saw their new orders decreased by 2.5% on the previous month. At the same time, during the observed period (December 2018), the manufacturers of consumer goods posted an increase in new orders of 4.2%. 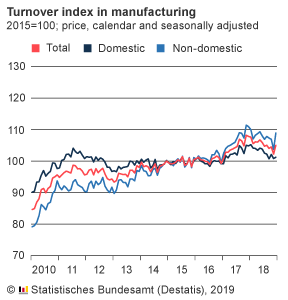 When it comes to the turnover in manufacturing in Germany during December 2018 there was an increase by 2.7% on the previous month (November 2018), price, seasonally and calendar adjusted. The revised figures for the turnover in manufacturing in November 2018 show a decrease of 2.2% to October 2018 (primary -2.4%). All new orders and turnover data presented here is based on the volume index of manufacturing, seasonally and calendar adjusted by means of X13 JDemetra+.